Are you finding Excel bill of materials spreadsheets too painful? New companies often begin their path to product lifecycle management software by looking for Excel bill of material spreadsheets. These BOM spreadsheet templates are easy to create, and can be useful for a short period. However, after you have several Excel BOM spreadsheets, you'll begin to see the complexity and expense of maintaining them. And the risk of costly production errors rises significantly as your collection of bill of materials spreadsheets grows. The problem? Excel bill of material spreadsheets can't enforce product data accuracy. You're working with bits of data, not a consistent part object. One cell is pretty much the same as any other cell. Each element of part data must be entered over and over again. It's far too easy to create duplicate or enter invalid part numbers. Every worksheet cell is a never-ending source of potential — and often very expensive — errors. Spreadsheets are a cheap tool for managing bills of materials. But they're surprisingly costly to create and maintain, and frequent clerical errors make them expensive to use. Multi-level BOMs are incredibly useful, but Excel fights you at every step. For example, consider an automobile's electric window motor assembly, common to 4 door locations. Listing these motor assemblies within the complete product structure requires you to manage 4 identical lists, one for each door assembly. And if the motor assembly has subassemblies, or is used across many products, imagine the time and effort wasted in finding and updating a single component. Design files? Revision control? Not in Excel! There's no history of who changed something, when or why it was changed, or whether you're looking at the approved revision of each item. Managing qualified supplier parts is tedious and time-consuming. Attaching related design files, datasheets and specifications is impractical. Frequently-used parts are difficult to locate and manage across multiple BOMs. 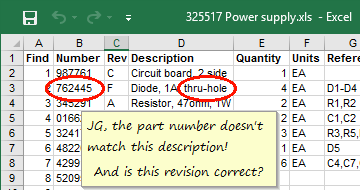 If you're using Excel to calculate product cost roll-ups, it's not easy maintaining part unit costs except for very basic assemblies. And it's essentially impossible to record substance content for RoHS and WEEE material declaration reporting. Excel simply can't structure the detailed data that should be associated with each part. PDXpert makes finding the interrelationship between all of our parts effortless, including our Suppliers' part numbers. 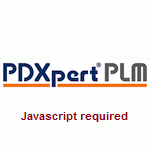 PDXpert PLM software is specifically designed to avoid the time, effort and errors of Excel BOM spreadsheets.